As a central mediator of the natriuretic peptide-cGMP signalling cascade, membrane bound type II cGMP dependent protein kinase (PKG II) is a key regulator of bone growth, renin secretion, and memory formation. It represents an important drug target for treating osteoporosis, cystic fibrosis, and memory loss [1–5]. In spite of its crucial physiological roles and its importance as a therapeutic target, little is known about its mechanisms of cyclic nucleotide selectivity and activation due to a lack of structural information. PKG II contains an N-terminal regulatory (R)-domain that binds a C-terminal catalytic (C)-domain in the absence of cGMP. Binding of cGMP to the cyclic nucleotide binding domains (CNB-A and B) within the R-domain releases the C-domain, leading to activation. We sought to understand the cyclic nucleotide selectivity and activation mechanisms of PKG II by studying each CNB domain. We screened and identified CNB domains of PKG II that are suitable for our structural studies using a high throughput Ligation Independent Cloning method. Our affinity measurements of the resulting CNB domains showed that CNB-B binds cGMP with a higher affinity, providing almost 500-fold selectivity, while CNB-A only offers 10-fold selectivity . To understand the structural basis of each domain's cGMP selectivity, we solved crystal structures of CNB-A and -B in the presence of cyclic nucleotides. The structures revealed that only CNB-B shows an ordered C-helix that shields the cGMP pocket and specifically interacts with the guanine moiety through several hydrogen bond and VWD contacts. In contrast, CNB-A displays an open pocket without a C-terminal helix, resulting in fewer interactions with cGMP. Our mutation analysis demonstrated that the polar contacts at the C-helix of CNB-B are crucial for high cGMP selectivity and kinase activation. Our structural comparison with cGMP selective PKG I CNB-B domain shows that it lacks cGMP specific hydrogen bonding contacts at the C-helix, which suggests a distinct cGMP selectivity mechanism for PKG II's CNB-B (Figure 1). Cyclic nucleotide compartmentalization is crucial for signalling specificity and exists in both cGMP and cAMP pathways [7–10]. 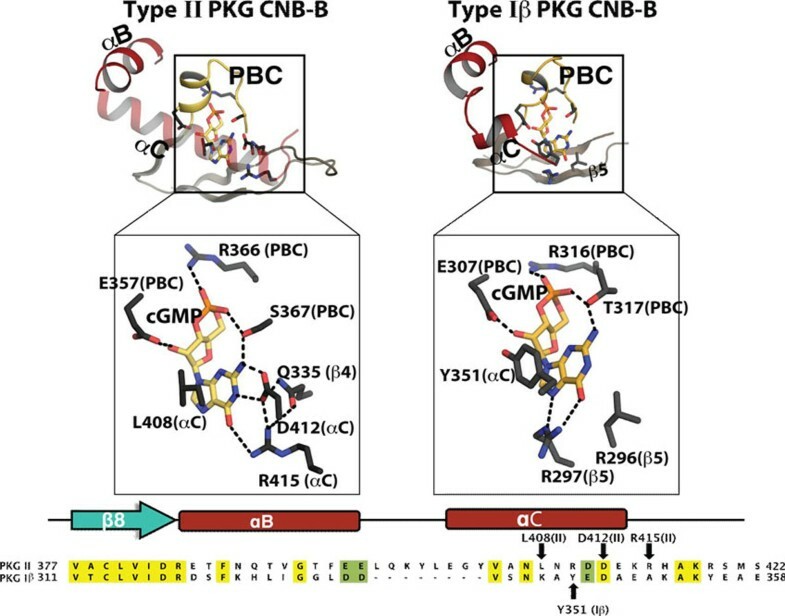 Due to higher cAMP concentrations at the cell membrane compared to the cytosol, the higher cGMP selectivity seen in CNB-B of PKG II might be important in preventing activation of PKG II by cAMP, and this might minimize undesired cross-activation of both cyclic nucleotide signalling pathways.